These little bites melt in your mouth! Rich chocolate truffle with a spicy bite. Best served solo-cold, or chopped up into a bowl of popcorn with peanuts. Set aside chocolate chips and fruit & nut chocolate in small dish. Set aside spices and vanilla in two separate dishes. Warm cream in small saucepan until just reaching boiling point. Pour cream over chocolates. Slowly blend the two via spatula and place over double broiler, continually stirring until the chocolate is completely melted. Remove from heat. Stir in vanilla and spices. 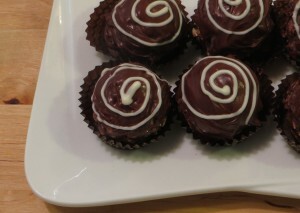 Use tablespoon to delve out dollops of truffle onto parchment paper, OR spray mini-cupcake tin and fill with truffle. Freeze roughly 1 hour until solid. Melt white chocolate and pour desired amount over frozen truffle bites. Sprinkle cinnamon over white chocolate. *Fruit & Nut Chocolate can be substituted with any favorite chocolate bar of equivalent ounce weight.